The comeback from Milan based Drakkar came rather unexpectedly. The band was founded in 1995 and released three albums between 1998 and 2002, before things became quiet. In 2007, the quintet self-released the EP Classified but I doubt that anyone really took notice. Five years later, they found a new label in My Kingdom, and are now back with their fourth longplayer When Lightning Strikes. Currently they are a quartet without a drummer. But this didn’t prevent them from coming up with a very solid album which won’t disappoint their fan base, although I doubt that they will be able to win over many new fans. Drakkar do their own thing very consequently and don’t care about current trends. They still play powerful melodic metal in this typical Italian vein, like we are used for instance from Rhapsody Of Fire. The music has a definite Nineties feeling and offers fast-paced riffs, catchy choruses, lots of keyboards and slightly high yet quite strong vocals and choirs. Occasionally the band may pile on too generously, but with a certain amount of tolerance, one might be able to let them pass. The band even shows a sense of humour, as for instance on Winter Soldiers where they added a fanfare part. The songwriting is really good, without blowing one’s mind though. Maybe the album is a little too long, as the band not always manages to set gripping impulses. Especially the short interludes occur too often, robbing the album some of its flow. Even though there is a Viking on the awkward cover painting, the lyrics have changed from the band’s past: When Lightning Strikes is a concept album about aliens. 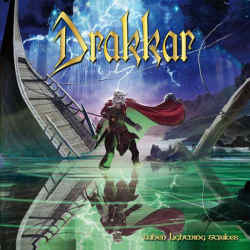 Drakkar have shown that despite some lengths they still have it, and they definitely have earned a second chance with their comeback album.